Ian Bailey said he had been put through "hell" with "this awfulness"
Ian Bailey will not be extradited to France after winning his Supreme Court appeal, in a case described as unique and of considerable importance. The French authorities wanted to question him about the murder of Sophie Toscan du Plantier near her holiday home in west Cork in December 1996. Mr Bailey has always denied any involvement in the murder and is taking legal action against the State for wrongful arrest. Speaking afterwards, Mr Bailey said he was thrilled and relieved with the judgment. He said the last 15 years had been very, very hard. He said: "This has obviously been a very trying time. I am obviously relieved that this particular part of the proceedings is over. There are many stages and matters still to be dealt with. "You wouldn't be able to believe the hell that we have been put went through by this awfulness." The five judges unanimously overturned a High Court decision and ruled Mr Bailey should not be surrendered to France. The court ruled that no decision to put Mr Bailey on trial had been taken by the French authorities. Such a decision is required under Irish law to allow someone to be extradited. Four of the five judges also ruled that he should not be extradited because the offence had been committed outside France. France would not be obliged to surrender a non-Irish citizen to Ireland in similar circumstances. Mr Bailey was awarded the costs of the High Court and Supreme Court hearings. 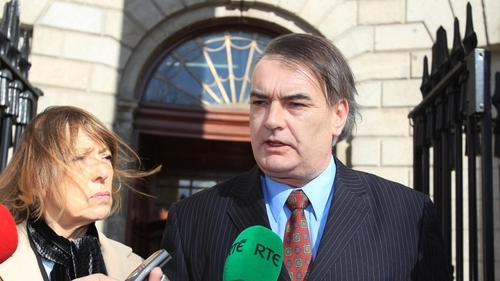 Ian Bailey's lawyer Frank Buttimer said what had surprised him was the political silence in relation to events that came out in court and were now in the public domain. He said it was a matter for those in authority to take stock of what has happened now and and take a serious look at the various issues in this case. He said the public had no idea about the life that Mr Bailey and his partner, Jules had to lead. Mr Buttimer said he had always maintained that the extradition attempt was misguided. Mr Buttimer said the European Arrest Warrant remained in existence and that further steps might have to be taken by Mr Bailey to address that concern. A lawyer representing the parents of Ms Toscan du Plantier has described the judges' decision as a disappointment and a shock. However, Alain Spilliaert said he was confident that the French investigation into her death would continue. The court did not address the issue of the new material provided to Mr Bailey's lawyers by the State. This was because lawyers for Mr Bailey agreed to an application by lawyers for the State that the court would decide the legal issues that had been argued first. But the material was addressed in the judgment of Mr Justice Adrian Hardiman, who described the production of the material at the end of last year as "an unusual feature" of the case. The judge said the material included an alleged attempt by an unnamed senior garda or gardaí to procure the State Solicitor for west Cork to bring political pressure to bear on the DPP to prosecute Mr Bailey. He said this attempt was resisted by the person who was asked to set it in motion. The documents included copies of emails written by then DPP Eamon Barnes and by State Solicitor for West Cork Malachy Boohig, as well as a memo about the case written by an official in the DPP's office. The judge said it was most unusual that documents of this sort were disclosed in this fashion. Mr Justice Hardiman said that he would not have favoured deferring the hearing of submissions on this issue. He said it would be very wrong and it is prohibited by law to bring any form of pressure to bear on the DPP in the exercise of his role and it is particularly objectionable to do so, or attempt to do so by the intervention of any holder of political office.